Bad Credit doesn't have to follow you. We can help you repair your credit and find the right car today. Let our network of dealers find the car that will get you back on the road again. Thousand of car buyers have used GSAC to obtain a fresh start. You can too. 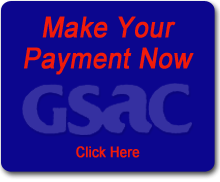 *GSAC makes no claims that it will remove accurate information from your credit report or otherwise change your credit history, except by accurately reporting your payment history with our company. GSAC reports all information to the credit bureau including, without limitation, made payments, late payments and failures to make payments when due.